Own "Volcano" by Carmine Appice. An eruption of rhythm behind the drum kit, Volcano showcases a head-on view of the drummer's explosive movements over a short and powerful duration of time. Viewers will note the entirety of Appice's kit, including his two bass drums sporting the drummer's name in foreground of the work. Measuring 40"x 30" on canvas, there are a total of 35 in the edition. 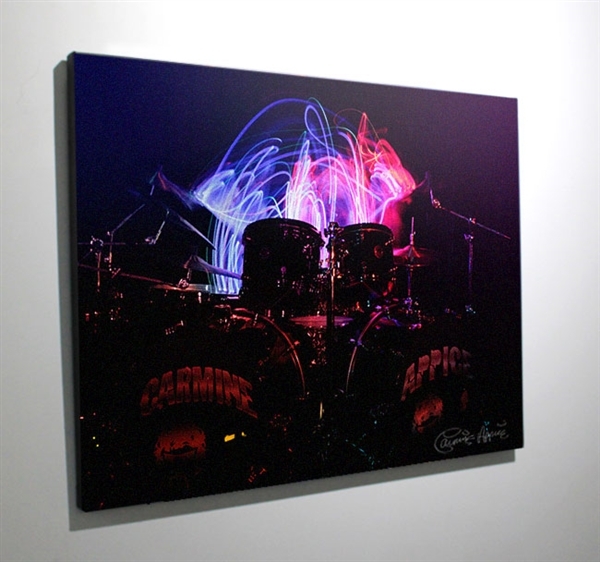 All are numbered and individually signed by Carmine Appice. Ships with Chromadepth glasses for a slightly different visual experience.